For other uses, see Afghani (disambiguation). The original afghani (ISO 4217 code: AFA) was introduced in 1925, replacing the Afghan rupee that was used from 1891 and other currencies. In addition to being subdivided into 100 puls, 20 afghanis were equal to one amani. The rate of conversion from the rupee is sometimes quoted as 1 afghani = 1 rupee 6 paisas, based on the silver contents of the last rupee coins and the first afghani coins. The afghani initially contained 9 grams of silver. Except during World War I Afghanistan's foreign exchange rate has been freely determined by market forces. However, for some periods, a dual exchange rate regime existed in Afghanistan: an official exchange rate which was fixed by the Afghan Central Bank, and a free market exchange rate which was determined by the supply and demand forces in Kabul's money bazaar called Saraye Shahzada. For example, in order to avoid the seasonal fluctuations in the exchange rate, a fixed exchange rate was adopted in 1935 by the Bank-e-Millie (National Bank), which was then responsible for the country's exchange rate system and official reserves. Bank-e Milli agreed to exchange afghani at 4 Afs against 1 Indian rupee in 1935. After the establishment of Da Afghanistan Bank as the Central Bank of Afghanistan, such a preferential official fixed exchange rate continued to be practiced. Although Da Afghanistan Bank tried to keep its official rate close to the Saraye Shahzada's exchange rate, the gap between the official and free-market exchange rates widened in the 1980s and during the civil war thereafter. The afghani traded at 67 Afs to one U.S. dollar in 1973. After the start of a civil war in 1992, the same U.S. dollar bought 16,000 Afs. Banknotes from the period of Zahir Shah's monarchy ceased to be legal tender by 1991. After the creation of a dysfunctional government and the start of the civil war, different warlords and factions, foreign powers and forgers each made their own afghani banknotes to support themselves financially, with no regard to standardization or honoring serial numbers. 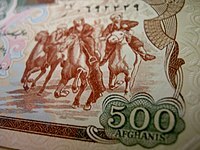 In December 1996, shortly after the Taliban took control of Afghanistan's institutions, Ehsanullah Ehsan, the chairman of the Taliban's Central Bank, declared most afghani notes in circulation to be worthless (approximately 100 trillion Afghani) and cancelled the contract with the Russian firm that had been printing the currency since 1992. Ehsan accused the firm of sending new shipments of afghani notes to ousted president Burhanuddin Rabbani in northern Takhar province. The exchange rate at the time of Ehsan's announcement was 21,000 afghanis to one U.S. dollar. It was then devalued to 43 afghanis to the dollar. Abdul Rashid Dostum, who controlled a self-declared autonomous region in northern Afghanistan until 1998, also printed his own money for his region. Following the United States invasion of Afghanistan, the currency became highly destabilized. The afghani traded at 73,000 Afs per one U.S. dollar in September 2001, steeply soaring to 23,000 Afs after the fall of the Taliban regime in November 2001, before plunging again to 36,000 Afs in January 2002. Around seven different versions of the currency were in circulation by that time. A former governor said at the time that maybe "trillions" of banknotes are in circulation as a result. In 2002, the afghani was denominated, and it received new ISO 4217 code AFN. No subdivisions were issued. It replaced the previous afghani at two distinct rates - issues of the government of former President Rabbani (de jure 1992-2001) were replaced at a rate of 1,000 to the new afghani, whilst the issues of warlord Dostum (1992–1997 in northern Afghanistan) were replaced at a rate of 2,000 to the new afghani. It was created in an effort to stabilize the economy and stop the rapid inflation. The notes were printed in Germany. The new currency was announced by President Hamid Karzai on September 4, 2002, and was introduced to the market on October 8, 2002. This monetary reform was well received by the public as it was a sign of security and stability, especially the country's rebuilding effort. People also no longer had to carry many bags of money for ordinary things. It was the first time in many years that a sole currency was under the control of the central bank instead of warlords. Most old banknotes were destroyed by the end of 2002. Da Afghanistan Bank has adopted a floating exchange rate regime and has let the exchange rate to be determined freely by market forces. The new afghani was valued at 43 afghanis to one U.S. dollar. After depreciating during the last quarter of 2003/04, the afghani has been appreciating steadily, gaining 8 percent against the U.S. dollar between March 2004 and July 2004. This appreciation, at a time of increasing inflation, appears to reflect a greater willingness by the population to use the afghani as a medium of exchange and as a store of value. This trend appears to be attributable to the relative stability of the exchange rate since the introduction of the new currency, administrative measures aimed at promoting its use, such as the requirement that shopkeepers must price goods in afghani. Donors are increasingly making payments in afghanis instead of U.S. dollars and this appears to be widely accepted. By 2009, the afghani was valued at 45 afs per one U.S. dollar. In 2019, the afghani reached 75 afs to a U.S. dollar. In 1925, bronze and brass 2, 5 and 10 pul, billon 20 pul, silver ​1⁄2 and 1 afghani, and gold ​1⁄2 and 1 amani coins were introduced, followed by silver ​2 1⁄2 afghani and gold ​2 1⁄2 amani in 1926. In 1930, bronze and brass 1 and 25 pul were added, along with bronze 3 pul and cupro-nickel 10 and 20 pul in 1937. In 1952, aluminium 25 pul and nickel-clad steel 50 pul were introduced, followed by aluminium 2 and 5 afghani in 1958. In 1961 nickel-clad steel 1, 2 and 5 afghani were minted; the 1 and 2 afghani coins show years of SH 1340 and the 5 Afghani coin shows the year AH 1381. In 1973, the new Republic of Afghanistan issued brass-clad-steel 25 pul, copper-clad steel 50 pul and cupro-nickel-clad steel 5 afghani coins. These were followed, between 1978 and 1980, by issues of the Democratic Republic of Afghanistan consisting of aluminium-bronze 25 and 50 pul and cupro-nickel 1, 2 and 5 afghani. A number of commemorative coins were also issued by the Islamic State of Afghanistan between 1995 and 2001. On 11 April 2005, coins were introduced in denominations of 1, 2 and 5 afghanis. Between 1925 and 1928, Treasury notes were introduced in denominations of 5, 10 and 50 afghanis. In 1936, 2, 20 and 100 afghani notes were added. The Bank of Afghanistan (Da Afghanistan Bank) took over paper money production in 1939, issuing notes for 2, 5, 10, 20, 50, 100, 500 and 1000 afghanis. The 2 and 5 afghani notes were replaced by coins in 1958. In 1993, 5000 and 10,000 afghani notes were introduced. "A 'pothole cave' or 'mouth of a shaft' (or Pit cave) is said to be visible on the 10,000 afghanis banknote from 1993 as a limited dark area in the hillside above the ancient 'pol' or gateway at the ruins near Lashkar Gah. This is possibly the entrance to one of the man-made undergrounds at Qal'a-i-Bost." On 7 October 2002, banknotes were introduced in denominations of 1, 2, 5, 10, 20, 50, 100, 500, and 1000 afghanis. The 1, 2 and 5 afghani notes were replaced by coins in 2005. In 2004 and 2008, the security features on several denominations were improved. In 2014 a new 1000 afghanis note was introduced to prevent counterfeit notes. ^ a b c Da Afghanistan Bank. "Capital Notes Issuance and Auction Archived 2013-05-13 at the Wayback Machine." Accessed 26 Feb 2011. ^ a b c d e "Afghani Falls Against Dollar By 3% In A Month". TOLOnews. April 18, 2019. Retrieved 2019-04-18. ^ "Coins and Banknotes". Da Afghanistan Bank. 2019. Retrieved 2019-04-18. ^ Schuler, Kurt. "Tables of Modern Monetary History: Asia". Retrieved 2007-08-27. ^ "Chaos in Kabul amid currency rumours". 22 May 2018 – via news.bbc.co.uk. ^ "Dollar could be Afghan stopgap". 22 May 2018 – via news.bbc.co.uk. ^ "Afghanistan redenominates currency". 4 September 2002 – via news.bbc.co.uk. ^ wires, Staff and. "CNN.com - Afghanistan banks on new currency - Oct. 5, 2002". edition.cnn.com. ^ "Afghanistan coins". Numista. Retrieved 17 April 2013. ^ "Coining Hope In Afghanistan". CBS News. Retrieved 9 November 2017. ^ Gebauer, Herbert Daniel. 2004. Resources on the Speleology of Afghanistan. Berliner Hoehlenkundliche Berichte. Band 14. ISSN 1617-8572. Page 81. Wikimedia Commons has media related to Money of Afghanistan.